Couple of clean strikes over the fence from Axar Patel in the final over has given the Capitals a fighting chance. 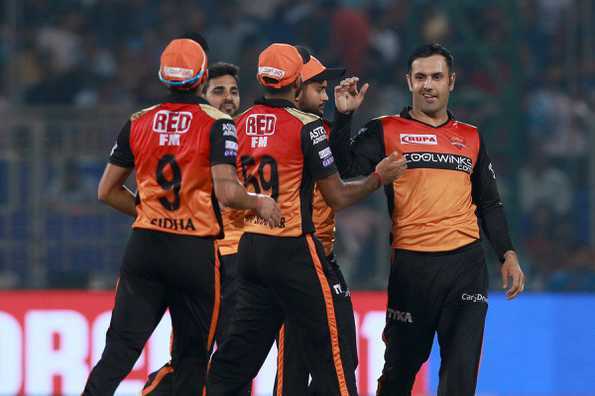 Siddarth Kaul missed his lengths and was punished for it by the left-hander, who swung cleanly and struck sweetly. This late cameo might just keep the hosts afloat on a pitch that’s quite challenging. But a lot depends on whether they can get through that SRH opening pair early. It’s a brilliant low catch from Manish Pandey, diving to his left at backward point. Wasn’t a wicket-taking delivery from Siddarth Kaul by any means. In fact, Ingram saw it as a boundary ball, slapped it hard but was undone by Pandey’s brilliance. Delhi are losing wickets, they’re not scoring many runs, but this might be the order of the day right through. Rishabh Pant curiously played a half-hearted loft off Nabi, which nearly carried all the way, but it was caught superbly at the boundary rope from Deepak Hooda. Then the experiment of sending Tewatia up the order proved to be short-lived as Sandeep Sharma proved to be too smart for him. Shreyas Iyer is battling along, and his current partnership with Colin Ingram is going to be crucial to fetch a fighting score. They’re 72/4 after 13. Carrying over from the dismissal of Prithvi Shaw, this pitch at the Kotla looks really sluggish. Mohammad Nabi is getting a lot of purchase even with the new ball. And Delhi might’ve actually done well to get to 36 as we’re into the final over of the powerplay. Oh hang on.. Almost on cue, Dhawan top-edges a sweep shot off Nabi to short fine leg. The hosts finish the powerplay at 36/2. How does the pitch look? On a different subject, Delhi Capitalsassistant coach Mohammad Kaif has raised concerns over teams misusing substitute fielders during the course of the game, which has contributed to the slow over rates we’re witnessing in almost every game. It’s just over a couple of nights after Delhi Capitals had that collapse in Mohali. Unfortunately, that mindblowing failure to close out the game – losing 7 wickets for 8 runs – has become the defining highlight of their campaign so far. Not the brilliance of Rishabh Pant or Prithvi Shaw. Not their impressive bunch of youngsters who’ve approached every game with a lot of intensity. Not the efficiency of their bowling attack. But that. And now, they’re up against a formidable Sunrisers Hyderabad unit who are coming off a sensational win against RCB. There’s no greater test of Delhi’s mettle than the one they’ll be facing today at the Kotla. But then, this will be a different kind of test for SRH too. The pitch in Delhi is expected to be slow and low, and probably won’t be to the liking of their opening combination of David Warner and Jonny Bairstow – who have produced three century stands in a row.